Maggie Hurley crafts this bevy of sweet-faced birds using vivid strokes and energetic colors. As a little girl, Maggie Hurley made it her mission to find injured birds, placing them in shoeboxes and nurturing them back to health. Now, many years and rehabilitated birds later, she paints them. Calling on the skills she learned at the Laguna College of Art and Design, Maggie crafts this bevy of sweet-faced, colorful prints. She plays with vivid strokes and energetic colors, giving the feathered friends expressions that are easily recognizable and almost human-like. Each of the thirty-two birds—from the Northern Cardinal to the Winter Wren—is printed on a six-inch square of birch wood. 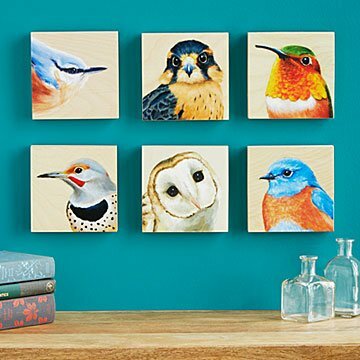 Choose your favorite of the flock and send it to your best bird-watching confidant, or hang its delicate beauty on your own wall. Made in Richmond, California, home of Point Isabel Park, known for its remarkable shoreline birdwatching. Maggie Hurley is a trained artist, but long before she discovered her desire to paint, Maggie wanted to save animals. As a child, she would often search for injured birds, placing them in a shoebox and nurturing them back to health. It's no surprise that she gravitates toward our flying friends now with her artwork. Maggie's collection of acrylic birds ranges from the Northern Cardinal to the Winter Wren, with a cast of distinct characters—often featuring human-like expressions—in between. Today, she lives and paints in Richmond, California, which is home to Point Isabel Park, a stunning spot to see shoreline birds. This is a made-to-order item. If you order today your item will ship no later than 5/8/2019. My mother and granny were (are) very special to me. They both loved cardinals. I saw the cardinal art portrait and had to have one - it's beautiful. I have bird feeders in front of my kitchen window and all these birds come to say "hi" almost everyday. Now I can see them all the time. Great quality and color! I will order a few more! These are really beautiful. I initially purchased 2 but plan to get more. I think a cluster of several of them on the wall will look really beautiful.